This beautiful property offering you a 3 bedroom villa with great quality finishing and a minimalist feel. It’s set on 800 sqm of land in Pejeng, near Ubud and has 514 sqm of build. It’s a perfect place for creative minds to flow with the sound of nearby river blending perfectly with gorgeous rice field, garden and jungle views. If you’re a writer, a painter or a yoga instructor you’re going to love this place! Each of the three bedrooms has an ensuite, the kitchen is western inspired, there is one living area, bungalow massage with shower, toilet and storage and plenty of storage space. An 10.5×5.5 meter swimming pool takes centre stage in the garden and there’s one car parking space and motorbikes. 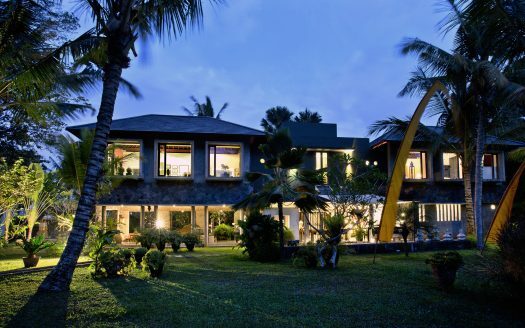 The villa is just 4.5km from the center of Ubud. It is about 12 minutes drive to traditional Market Pejeng, 15 minutes drive to Goa Gajah, 30 minutes drive to Tegalalang rice terrace. On sale at USD 400,000 lease for 25 years with option to extend. Not an opportunity to be missed.